The Exercise Now app is for patients to access video home programs provided by their therapists and health professionals. It works directly with the Exercise Pro Live online software system. Released in August of 2018, the Exercise Now app can be used with both mobile phones and tablets, both for Apple and Android platforms. Following are five great benefits for having your patients use the phone app. First, the Exercise Now app is very user friendly and designed to be so simple it is impossible to get lost or confused. 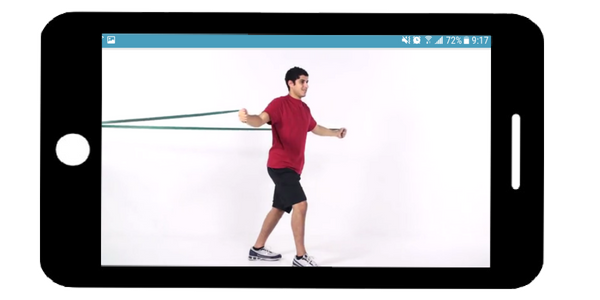 This is just the way we think an exercise app should be. The patient opens the app, and on the main screen the home program is displayed. Just click on the home program icon and the video exercises begin. 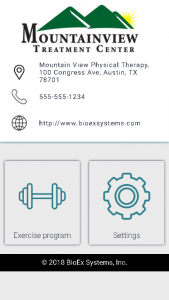 Each exercise informs the patient the proper number of sets and reps. Once the exercise is finished, the patient taps the next button and the app takes the directly to the next exercise. Simplicity and no distractions, making it perfect for the power phone user or the beginner. 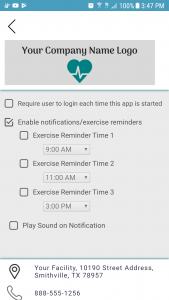 And speaking of no distractions, the app allows the therapist and the patient to set automatic exercise reminder times. No more forgetting to do the home program. Just set a reminder time and the app takes care of keeping things on track. If you aren’t already using Exercise Pro Live for your home exercise software, try it out now for free. Use it for all your patients for two weeks, no obligation, no credit card required. Third, it is free for your patients. There are no fees for the patient or therapist. This means no risk for anyone. The patient downloads the Exercise Now app, uses it and when they are done, uninstalls it if needed. And best of all, there are absolutely no ads. That’s right, no annoying ads, and no one trying to sell your patients products or services. Absolutely nothing to keep them from their home exercise program. And it is not just for phones; it can be used on iPads, and Android tablets. 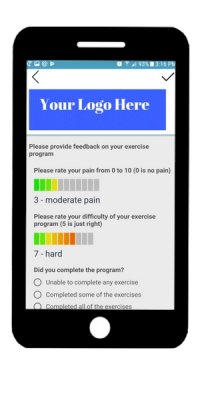 Once the patient has finished the home program session, the app automatically takes them to a feedback screen so information on difficulty level, pain level and completion status can be recorded and sent directly to the health professional. Our Exercise Now app also has a messaging screen so patients can maintain a direct line of communication with their health care provider to help get answers to any questions that may arise. Keeping your patient involved and responsible with home programs keeps them engaged and an active participant in their rehabilitation. 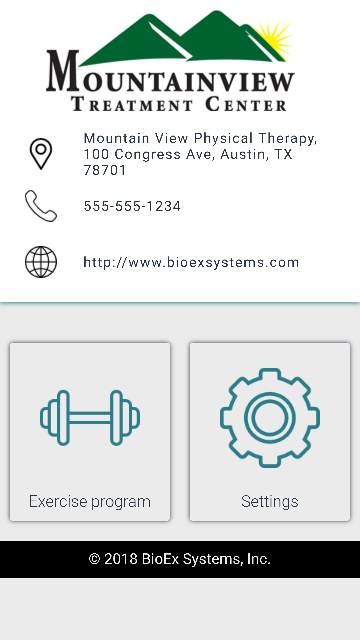 And finally, in plain view on the main screen is the logo of the facility, and complete contact information such as phone, website and location. This can help promote your therapy center and create a professional image for your company. 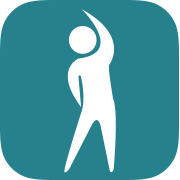 So remember to mention the Exercise Now app to your patients and recommend they download it and use it for all their home exercise programs. 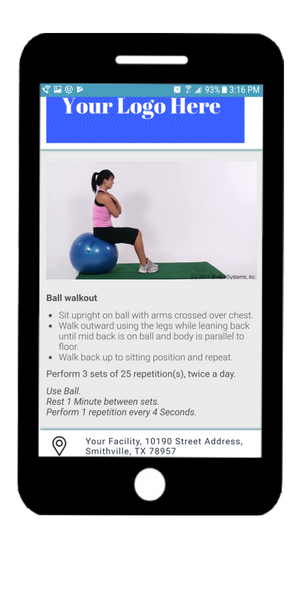 It’s easy to use, provides detailed exercise videos, contains automatic reminders, promotes a professional image for your clinic and keeps the patient motivated and involved in their health care.